Facebook is all about showing your face. But would you show your face online to call out clerics who defend militants? In Pakistan, weeks after the school attack in Peshawar, this is what’s happening in a sombre version of the ice bucket challenge. The challenge targets Maulana Abdul Aziz, a cleric who leads prayers at the Red Mosque in Islamabad, which is known for its radicalism and Taliban links. While he played no role in the school attacks his refusal to condemn them angered ordinary Pakistanis. 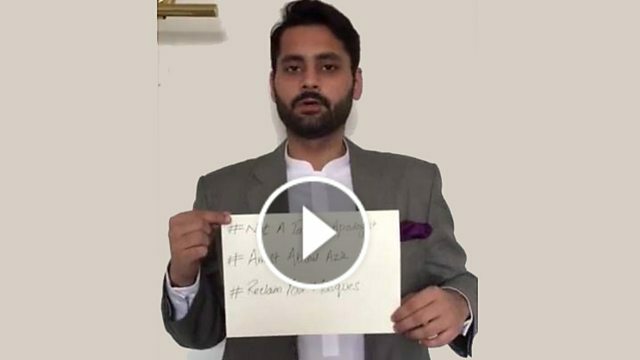 The campaign #ArrestAbdulAziz is led by the activist Jibran Nasir and asks people to post videos online calling for the arrest of the cleric and nominating their friends to follow suit. We talk to him as well as others who took part.